Here you find all the frequently asked questions. Can caterpillars be raised by children? Yes, caterpillars make excellent pets for children. When small children are supervised by adults, raising the caterpillars into butterflies is easy and fun. 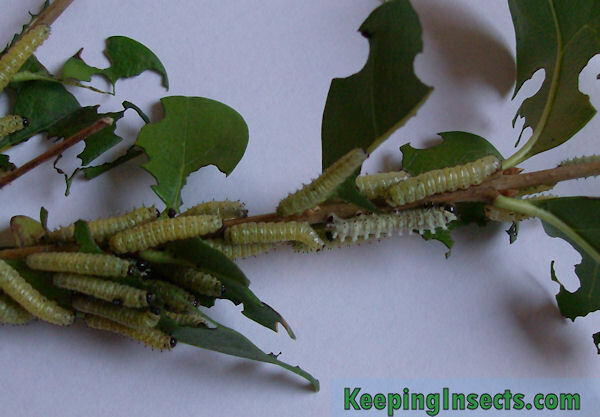 Children above 11 years of age can be expected to take care of caterpillars without much help. Some species are hard to keep because of their specific needs in temperature or food, those species can be disappointing to keep for children. At the species description you can read which species are easy to keep and which ones are a bit more of a challenge. Can I raise caterpillars that I find in nature? Yes you can. But to do so, you need to know what food plant they eat, what temperature they need and what humidity they need. Most of this information you can gather at the moment you find a caterpillar. The plant on which you found it is most likely its food plant. When keeping the caterpillar as a pet, you can mimic the temperature and humidity of the place you found it in nature. It is forbidden to take protected species out of their habitat or import foreign species of insects into your country. Make sure you know which species are protected and what the law is in your country or state before you take any animal out of nature. Can caterpillars be dangerous to my health? 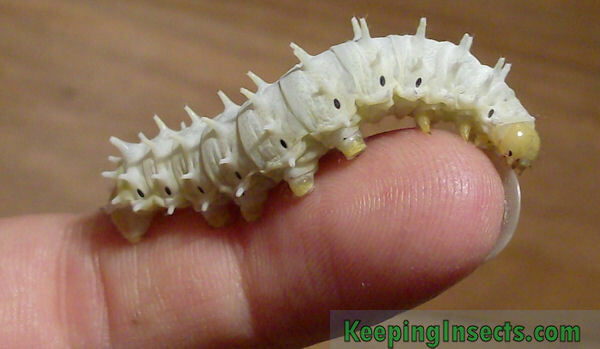 Caterpillars that are sold as pets are generally not dangerous at all. Only some species are poisonous when ingested. They do not excrete poison. Some caterpillars that can be found in nature have long hairs on their back that can be irritation to people with asthma or can cause an allergic reaction. If you take a caterpillar out of nature, make sure you know which species it is and if it has these hairs. This is different for all species. Species without a mouth generally live a short time, between 5 and 8 days. Species that do feed, for example on nectar, can live for a time between several weeks or several months. 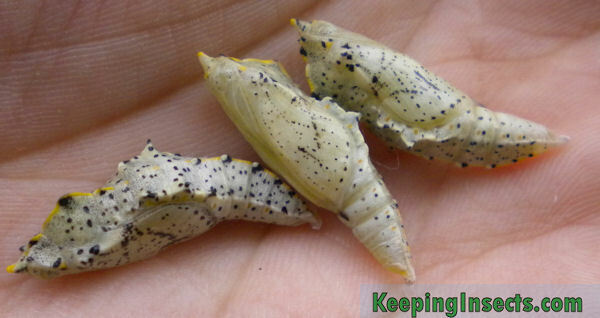 When will a pupae / cocoon transform into a butterfly? This can take a time between 2 weeks and one or even two years. Most species of butterfly stay in their pupal stage for two to four weeks, but some species have pupae that stay dormant all through winter. The pupa inside the cocoon will not develop but just wait for months or sometimes even two years before it will start to develop again and eclose as a butterfly. Eclosion is triggered by temperature and an internal clock (biological time mechanism in the brain of the caterpillar or pupa). What is the difference between a chrystalis, pupa and a cocoon? A chryalis and pupa are two words for the same thing, the third stage in the life of a butterfly or moth (the four stages are egg, caterpillar, pupa, and adult moth or butterfly). Some moths also form cocoons. The cocoon is an outer rapping made by the caterpillar using silk produced from glands in the caterpillar’s mouth. 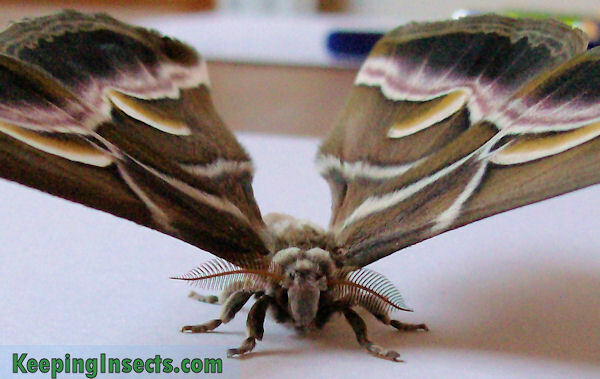 Sometimes the caterpillar will fasten leaves together with silk to form the cocoon, while other species (such as the silk moth) form the entire cocoon from silk. The caterpillar then pupates (forms the pupa or chrysalis) inside this protective covering. Butterflies do not make cocoons.